Skoda has unveiled the vRS version of the new Octavia which will be officially launched at the Goodwood Festival of Speed in July before going on sale in August. Both hatchback and estate versions will be available and prices are expected to start at around £23,000. There will be two engines available - a 2.0 TSI with 220PS and a 2.0 TDI with 184PS - both with six-speed manual gearboxes. The TSI version accelerates from 0-62mph in 6.8 seconds with a top speed of 154mph making it the fastest Octavia model ever. The TDI does the same 0-62mph in 8.1 seconds. The TSI version accelerates from 0-62mph in 6.8 seconds with a top speed of 154mph making it the fastest Octavia model ever. 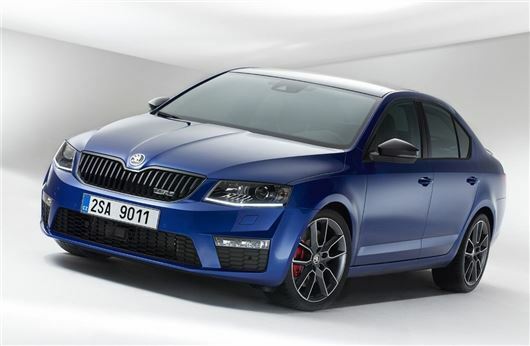 To go with its sporting nature the vRS gets sports suspension and has been lowered by 12mm plus it has the impressive XDS electronic differential as standard. This system cleverly brakes the inside wheels in corners, making the car feel more agile and meaning less steering lock is required. It also has new electro-mechanical progressive steering.